From back racks to bullbars, flares, rails and visors, we offer much more than Line-X coatings. Learn more about what we carry on our website, or come down to our showroom to browse our selection in more detail. Our complete van upfitting solutions are certified and warrantied. Learn more about our aluminum and steel solutions. Visit our showroom to see our demo van and your options. 300% TOUGHER. GUARANTEED FOR LIFE. 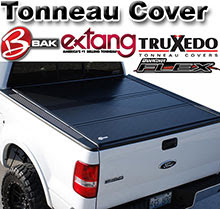 Browse our catalog of mud guards, floor mats, tonneau covers, running boards, and other items currently in clearance. Over the past 15 years, we have taken our experience and knowledge and grown into one of the regions most recognized and trusted names in spray on truck bed liners and industrial coatings. At both of our locations in Guelph and Cambridge, we pride ourselves on being a premium coating and accessory company leading the industry in quality and service. Contact us for a quote or visit us to learn more!